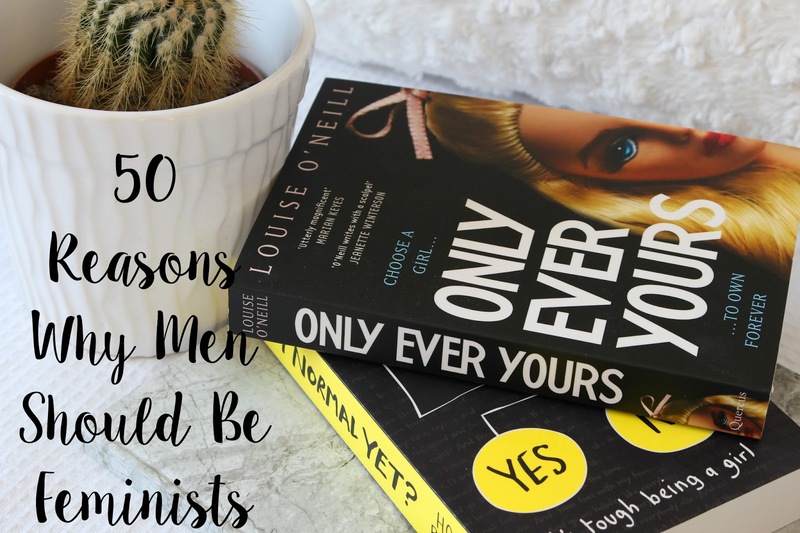 At the start of this month, I shared with you 50 reasons why I am a feminist and you guys seemed to really enjoy it but most importantly agree with the points I was making. In my quest to do more posts about feminism on my blog, today I thought I would share with you something very similar to what I did in my last post about feminism. Today, I want to tell it from a man's perspective. Obviously, I am a woman! I am a white, middle-class, straight woman so my perception and experience with feminism are very different to that of a black, trans feminist or even a male who identifies himself as a feminist. Feminism isn't just for women! Here are 50 reasons, why not! Enjoy! 27. Because men are taught that they should fight for dominance between a group of guys by putting other guys down. 48. Because feminism isn't about demonising men. In fact, it's there to help you guys out too! 49. because although the word feminism has 'fem' in it, it doesn't mean it is strictly for women! 50. Because Men should understand and recognise that ,women don't hate them. Feminism isn't just about women it's about equality for everyone- and that includes men too!! Are you a feminist? Do you know any men that are feminists? Do you think feminism should just be for women or for men as well? Let me know in the comments below! This is a great post. I feel like there's a lot of negative connotations around feminism because people don't entirely understand the meaning, when really it's simply about men and women being EQUAL. I definitely think men can be feminists too, and I find it really encouraging when a man is not afraid to stand up and say that he is! LOVED this! Like, honestly there's ZERO reason for men (or anyone) not to be feminist. It's crazy we're currently having elections in Austria between two people and one of them openly stated that he loathes feminists and that he is against equal rights for women and men. Still he got 50% of the votes. Like HOW can you vote for someone like that? Yes!! Every single damn one of these. perfect post ! I love the way you think.. This is a great post Nicole! I have to say, I wouldn't have classed myself as a feminist as I didn't understand the word as such - media has portrayed it to be such a negative thing :(, but after your post I am warming to the idea. I recently watched a video on YouTube on which Emma Watson spoke her feelings about feminism for the He4She campaign, well worth the watch! This needs to be sent to every guy! Great points! This is so true! I think feminists get such a bad rep that people assume they're just men haters! That is really positive and encouraging to hear! I understand that different generations of people have different views on topics like feminism as they grew up with up. That is why I think it is really important to educate up and coming generations so that they have more understanding of the concept and are able to help make bring complete equality for men and women! This is such a great post! I think its very important to educate people about the true meaning of feminism; that is for women AND men, and you do such an awesome job of explaining why!